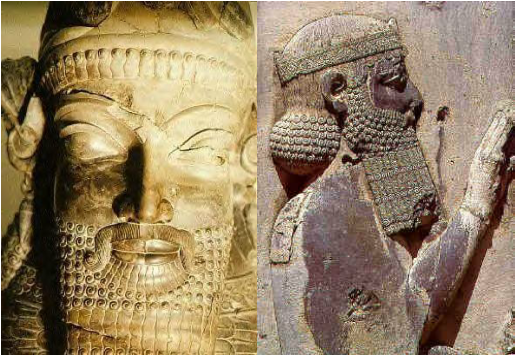 Chapter 12 Transformations in Asia, 220-1350 A.D.
Just as the Medes and other semi-civilized peoples had banded together to bring down Assyria, so they in turn were brought down by others living on the fringes of the more sophisticated civilizations of the Fertile Crescent. In 550B.C., another Indo-European tribe living on the Iranian plateau known as the Persians rebelled against the Medes and overthrew them. In a remarkably short period of time, the Persians forged the first great multi-national empire in history. At its height the Persian Empire encompassed nearly 50 million people in a territory that stretched from India to Africa, and from the Black Sea to the Indian Ocean. Under its broad umbrella, ideas and cultures mingled as never before, stimulating developments both within the empire and along its borders. Like the Medes, the Persians were part of the Indo-Aryan or Indo-Iranian branch of the Indo-European-speaking peoples who had migrated from the Eurasian plains of southern Russia onto the Iranian Plateau sometime around 1500 B.C. While many of these Indo-European speaking tribes had continued to move southeast, across the Hindu Kush into northern India, some had settled in the valleys of the Elburz and Zagros mountain ranges - the most important of these latter tribes were the Medes and the Persians, who between them would create one of the ancient world's greatest empires and perhaps the first truly multi-ethnic and multi-cultural civilization in history. The Physical Environment. For the most part, the Iranian plateau is a forbidding, stark landscape surrounded by high mountains in the north, west and southeast and by the Persian Gulf and Indian Ocean in the south. With little rainfall, except in the mountains, it is a region subject to harsh extremes of heat and cold. To the north, just below the narrow southern coastal margin of the Caspian Sea, the Elburz Mountains rise sharply to the snow-capped peak of Mt. Damavand, over 18,000 ft. above sea level. 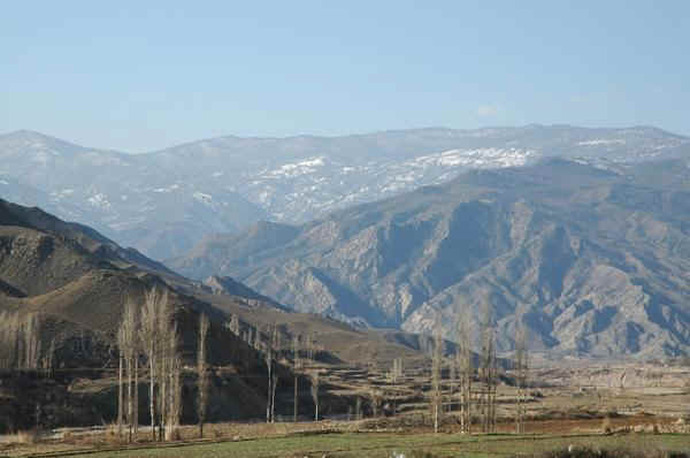 The height of the mountains means that the moisture generated by the Caspian climate region falls as rain or snow almost entirely on the northern slopes of the Elburz. Consequently, while the Caspian coast and the northern slopes of the mountains are lush and green with vegetation, both the southern slopes of the range and the central Iranian Plateau to which they descend so dramatically are largely arid and rocky, barren of greenery except along the bottoms of gorges where streams carry snow-melt down to the southern plains. South of the mountains, occupying much of the central part of the plateau, stretches the Dasht-e Kavir desert. In the southeast, the great salt desert known as the Dasht-e Lut runs down into the Helmond Basin before reaching the jagged peaks and tortured landscape of the Hindu Kush Mountains. Only in the northeast is the landscape open and still relatively fertile. It was probably through this opening from Central Asia, between the Caspian Sea and the Aral Sea, that most of the Indo-Aryan tribes first passed into Iran, the first of many waves of migrations and invasions that would shape the history and cultures not only of the plateau but of the world. These northeastern grasslands, a region known as Khorasan, became perhaps the richest part of Iran, a source of wealth and power that sustained many rulers. Irrigation agriculture and pastoralism. 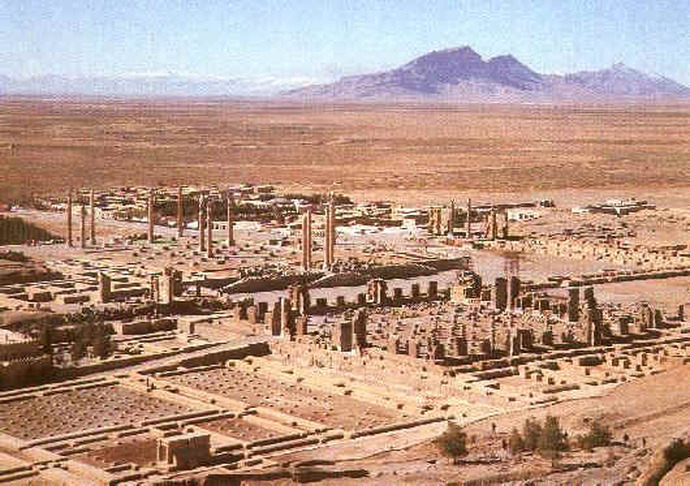 Most of The Iranian Plateau was arid, lacking open sources of water. Scattered throughout the plateau were areas of vegetation, oases where water filtered up from underground. Such a landscape did not lend itself to settled agriculture except in a few locations, such as the oases, the narrow valleys of the Zagros and Elburz mountains, and the narrow coastal strip along the Caspian Sea. Nevertheless, the peoples who inhabited the plateau soon learned to make the most of their resources. Snow-melt from the mountains, for example, normally ran off in spring and summer, but quickly evaporated in the hot plains. To capture the precious substance, people dug long sloping underground canals, called qanats, for miles out into the plains. Channeled into these underground passages, the melting snow-waters were protected from the sun and could be tapped by wells that had to be dug deeper the farther away they were from the mountains. Around such new water sources, the ancient Iranians developed irrigation agriculture. While some of the early Aryan tribes thus developed ingenious techniques to make agriculture possible, others continued to lead a semi-nomadic existence, herding their horses and cattle. Early culture and society. Like other nomadic peoples, the Persians were patriarchal. By the time they had settled in the plateau, both Medes and Persians were ruled by tribal chieftains who had become petty kings. Advising these kings were the leading men of the clans and tribes. We know little of the role of women, but polygamy was common. Living on the fringes of Mesopotamian civilization, the Medes and Persians were exposed to civilized techniques of living. Still primarily pastoralist, however, they spent much of their time raiding and being raided for cattle, horses, and women. With war and raiding as a natural part of life, the Iranians were magnificent horsemen and good fighters. Early religious practices. The early tribes viewed the whole world as alive with spirits. They worshipped these spirits, especially the sun and the moon. The most important early deities were Mithra, the god of the sun, and Anahita, the goddess of fertility and vegetation. Sometime after they had settled in Iran, the tribes formalized many of their religious practices. In western Iran, the Median tribe known as the Magideveloped a religious system much like that of the Indo-Aryans in northern India. Fire played an important role in religious rites. Many of the early temples were constructed around the naturally occurring gas fires, for example, and became known as fire temples. Although the Iranians did not worship fire itself, they saw it as representative of the forces of nature, a direct connection between the earthly and the spiritual realms. At the heart of their religion were constant sacrifices to the gods. The most important sacrifices were of horses, later of cattle, and eventually offerings of food and drink. Critical to the sacrifice was the presence of a Magian priest, who spoke aloud the ritual formulas necessary for the offerings to be acceptable to the gods. Zoroaster. Sometime in the 600s or 500s B.C., however, Zoroaster (Zarathushtra in Persian), a prophet-reformer from eastern Persia (628-551), launched a major movement to reform the religious practices of his people. Perhaps influenced by similar developments taking place in India, Zoroaster preached against the prevailing form of polytheism and ritual sacrifice, and called on people to worship the one true god, Ahura Mazda. Introducing a moral doctrine that distinguished between good behavior and bad behavior among people, the prophet-reformer taught that the earthly world was a battleground between the good forces of Ahura Mazda and the evil forces of Ahriman, the Enemy. Man was free to choose between them but his actions would be judged after his death. The just man would be rewarded by a life of eternal blessings; the wicked would suffer everlasting punishment in hell. Zoroastrianism was thus based on an ideal moral life and on devotion to Truth. Lying was the greatest sin for it was the primary tool of the evil spirit Ahriman, who was also called the Great Liar. For many years, scholars have referred to Zoroastrianism as a dualistic religion, meaning that it described a world evenly divided between the Good God and the Evil God. 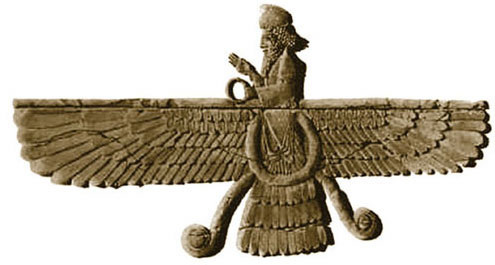 In fact, however, Zoroaster seems to have conceived of Ahura Mazda as the only true god, the supreme creator and judge of the universe, a view we call monotheism today. He taught that good would always eventually overcome evil. Ahura Mazda was supreme, and would prevail over Ahriman, who would be cast into eternal fire at the end of time. Zoroaster’s concept of Ahura Mazda, however, remained relatively impersonal and abstract. Many people needed a sense of closer contact with the divine. 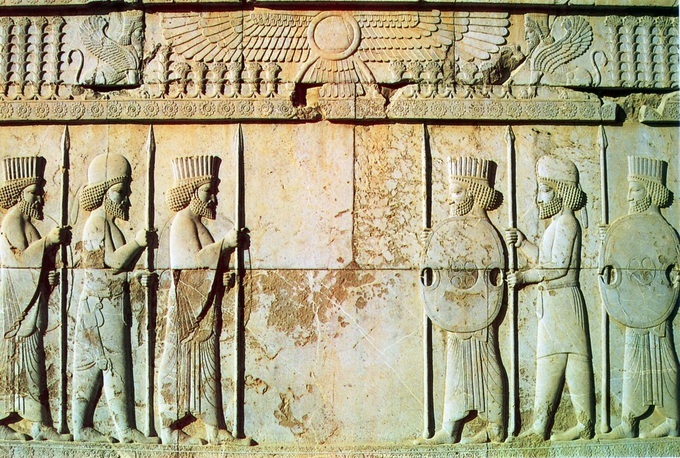 Consequently, in spite of its influence and success, Zoroastrianism never fully superseded the traditional Iranian gods, such as Mithra (god of the Sun and light) and Anahita (goddess of water and fertility). In later years, these figures were incorporated into the web of Persian religion as either children of Ahura Mazda who carried on the struggle on earth, or as daevas, or angels, who supported either the forces of goodness and light or the evil Ahriman. Sometime in the last half of the 600s, from their capital at Ecbatana (probably modern-day Hamadan) in the northern Zagros Mountains, the Medes set about conquering the other Iranian tribes, forging them into a confederation. In alliance with the Neo-Babylonians, in 614 the Median kings also finally conquered the declining Assyrian empire to which they had long owed tribute, and took control of northern Assyrian territory. In the middle of the 500s they further extended their influence westward to the Halys River. As they grew in power, however, the Medes imposed greater and greater controls and burdens on their subjects, often acting arrogantly toward the other Iranian tribes. In 550 B.C., Cyrus II, king of the Persians, a client tribe of the Medes that had settled in the southern Zagros Mountains with their capital at Susa, overthrew his Median overlord, King Astyages, and proclaimed himself “king of the Medes and Persians”, thereby establishing the Achaemenid dynasty. Cyrus was a great conqueror. He subjugated Lydia, the kingdom of the famous king Croesus, and with it the Greek cities of Asia Minor. To the east, he pushed the frontiers of the empire into northern India and in the northeast, to the Jaxartes River (modern Uzbekistan). In 539-538, he conquered Babylon, and was proclaimed by the priests of Marduk "king of Babylonia". Soon after, Syria, Palestine, and Phoenicia voluntary submitted to him. His son and successor Cambyses (530-522) added Egypt to the empire (525), but died there under circumstances that suggest assassination. In 522, Cambyses’ cousin, Darius, became king during a period of internal turmoil over the succession. After quelling numerous rebellions, he too pursued an expansionist policy, especially in the east, where he consolidated the conquests of Cyrus. In the west, he campaigned into Europe, conquering Thrace, and even crossed the Danube River. Darius the king says: By the will of Ahuramazdã I am king. Ahuramazdã delivered the kingship to me. The King of Kings was the supreme law, the commander of the army, and the head of civil administration, deciding all important appointments. He was surrounded by a court and protected by an elaborate ritual designed to enhance his aura of majesty. 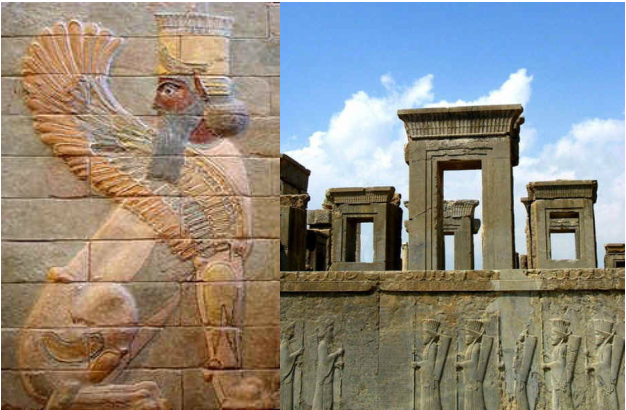 The court followed him as he traveled to his different capitals: Susa in winter; Ecbatana in Summer; Pasargadae, the great palace built by Cyrus south of Susa, where coronations took place; and occasionally Babylon or Persepolis, the imperial city built by Cyrus and enlarged by Darius. Darius divided the empire into provinces called satrapies, each ruled by a governor, or satrap, appointed by the king. The satraps were extremely powerful, functioning virtually like kings in their own right. In time, their functions tended to become hereditary. They had their own chancelleries, their own administrations, and their own courts, all of which copied the ceremony of the Great king’s court. They were in charge of the provincial civil administration, of the finances, and of justice, as well as of the recruitment of troops for the central army. Keeping a prudent eye on these governors, however, lest they plot his own downfall, the Great King used imperial agents known as "The King's Eyes and Ears" as inspectors to control and rule his possessions. On a regular basis, these imperial inspectors traveled throughout the provinces checking tax and judicial records, and investigating complaints about the administration of the satraps. At intervals all along the road are recognized stations, with excellent inns, and the road itself is safe to travel by, as it never leaves inhabited country. In Lydia and Phrygia, over a distance of 94 1/2 parasangs -- about 330 miles -- there are no stations. On the far side of Phrygia one comes to the river Halys; there are gates here, which have to be passed before one crosses the river, and a strong guard-post. Once over the river and into Cappadocia, a distance of 104 parasangs, with 28 stations, brings one to the Cilician border, where the road passes through two sets of gates, both guarded. These left behind, the distance through Cilicia is 15 1/2 parasangs, with three stations. Separating Cilicia from Armenia is a river, the Euphrates, which has to be crossed in a boat, and the distance across Armenia itself is 56 1/2 parasangs, with 15 stations or stopping-places. Here, too, there is a guard. Through this part of the country four rivers run, all of which have to be crossed by a ferry: the first is the Tigris; the second and the third both have the same names --Zabatus -- though they are different rivers and flow from distinct sources, one rising in Armenia, the other in Matiene; and the fourth is the Gyndes -- the river which Cyrus once split into three hundred and sixty channels. Leaving Armenia and entering Matiene, one has 137 parasangs to go, with 34 stations, and, passing from thence into Cissia, another 42 1/2 with 11 stations, which brings one to the river Choaspes -- another navigable stream -- on which the city of Susa stands. Thus the total number of stations, or posthouses, on the road from Sardis to Susa is 111. If the measurement of the Royal Road in parasangs is correct, and if a parasang is equal (as indeed it is) to 30 furlongs, then the distance from Sardis to the palace of Memnon (450 parasangs) will be 13,500 furlongs. Travelling, then, at a rate of 150 furlongs a day, a man will take just ninety days to make the journey. Religious policy. Darius followed the advice of his predecessors and maintained a general policy of tolerating the local customs, religions, languages, and even legal systems of his diverse subjects. In fact, the subject populations retained a great deal of self-government. As long as they paid their tribute and furnished troops to the royal army when requested, the king did not interfere in their domestic affairs. It was a particularly good policy for this first truly multi-ethnic and multicultural empire created by the Persians. Ultimately, however, what allowed the Persians to maintain control over their vast domains and to expand them even further was their army. "Persepolis The Persian Soldiers" by Arad - Own work. Licensed under CC BY-SA 3.0 via Wikimedia Commons. The Persian army. The core of the Persian army was made up of professional soldiers stationed in the most strategic locations of the empire. The elite was the famous battalion of the 10,000 "immortals," which always remained at the direct disposal of the Great King. The name came from the fact that casualties were immediately replaced to maintain the numbers. This army was reinforced with local recruits as needed. The Persians were especially famed for their archers and their war-chariots with iron sickles attached to the axles. Despite these advantages, however, the army had some weaknesses. The regiments recruited from the imperial provinces, for example, fought according to their own customs, using their own weapons and tactics. This made the Persian army as a whole rather disorganized and chaotic. Against forces that had a high degree of training and coordinated discipline, even the mighty Persians might be at a disadvantage. In addition, for certain special types of warfare, notably naval warfare, the Persians had to rely on non-Persians within the empire. Greek, Phoenician, Egyptian, and Cypriot sailors, for example, manned the navy. Law. The Persians, heirs of the Babylonians in legal matters, attached great importance to organizing a society based on the law. The king was both the source of law and the final judge. Although the Persians respected the legal customs of the diverse peoples inside their empire, they also tried to superimpose a sort of common law, the "Laws of the Medes and the Persians", to which all subjects could appeal. Royal judges, often hereditary, implemented this system in the provinces. Darius the king says: Among these countries [those under Persian rule], whatever man was loyal I treated him well, [but] whoever was unruly I punished well. By the will of Ahuramazda these countries behaved according to my law. They did as I told them. 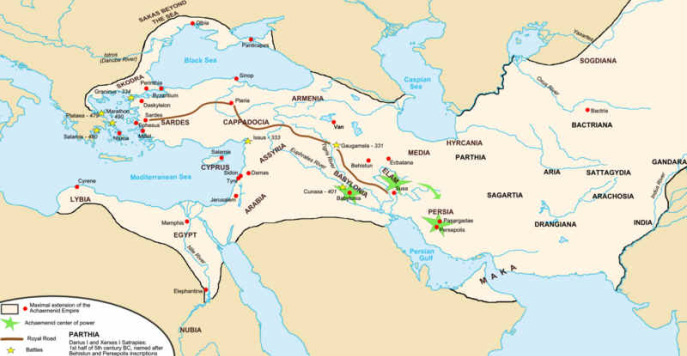 As in most large empires, agriculture was the major economic activity in the Persian Empire. The Great King and the aristocracy owned many large estates, but many independent landowners also farmed their own plots. The Great King used land to reward loyalty and thereby reinforce his political authority. He distributed large amounts of land to friends and relatives, known as the “royal benefactors”, rewarded civil servants with small estates, and gave soldiers estates known as "fiefs of the bow". The imperial government also encouraged trade and commerce by maintaining the excellent road system and a climate of peace and security. Furthermore, they established a standardized system of weights and measures, as well as a sound currency based on the gold daric, which was 98% pure and the chief gold currency in the world of trade, and the silver shekel, which was 95% pure. The adoption of Aramaic as a universal language for administration and business also helped the economic prosperity of this vast empire. On land, caravan roads crossed the empire without national barriers. On the sea, a prosperous international trade was in the hands of the eastern Greeks and the Phoenicians. The State intervened directly to support the economy, especially in matters of irrigation and in the building and maintenance of canals throughout the empire. For example, on the Great King’s instructions, a canal was dug between the Nile and the Red Sea to facilitate Egypt’s long-distance trade. Taxes were generally heavy, for the Persians insisted that all conquered lands were actually the property of the king. The Persians themselves paid no taxes, the entire revenue of the empire being drawn solely from the provinces. Each satrapy was required to pay a fixed amount in gold or silver, and each vassal state paid a fixed tribute in kind. The total amount of yearly income was astonishing: 14,560 Euboic talents (1 Euboic talent = 25.86 Kg. of silver) Hdt. III, 90-4). The Persian Empire thus became one of the wealthiest empires in history. Taxes served to pay for maintenance of the army, administration, and the royal court. Despite the importance of having a solid currency, however, as time went on the Great Kings increasingly horded their tribute in the royal treasury, rather than keeping it in circulation for trading purposes. Over time, therefore, less and less money in circulation drove people to an economy increasingly based on barter. Such a barter system prevented the emergence of more sophisticated banking procedures that would have allowed the accumulation of surplus money to finance non-agricultural activities. The social structure of the empire was like a pyramid. At the top sat the king. Below him were the noble families, then free citizens, freemen without civil rights and, at the bottom, slaves. We know very little of the social life of the empire. Slavery existed and took many different forms according to the different regional traditions within the empire. Yet the economic life of the empire never really depended upon slavery. Indeed, slavery was seen as an inefficient form of work and most Persians seem to have preferred to use free workers rather than slaves. The status of women also depended on local cultural traditions. Women had little independence in Persia, for example, but in Babylonia they enjoyed a certain degree of freedom: they could own property and dispose of it as they liked; they could write contracts; and they could manage their own businesses. Throughout the empire, however, polygamy was legal, its practice only limited by the obvious financial considerations. Like so many other invaders from the fringes of civilizations, having conquered their empire the Persians found themselves in charge of many peoples whose cultural development was more sophisticated than their own. Learning from their subjects, the Persians employed artists from all parts of their empire and borrowed many distinctive forms. Nevertheless, they also succeeded in creating an identifiably "Persian” style of art as well. In architecture, monumentality and symmetry were characteristic of their genius, as the ruins of Persepolis, Susa and other royal palaces show. Art was never devoid of political undertone: it served to symbolize the might of the empire and the grandeur of royal power. Persian artists also specialized in sculptural relief, metalwork, and jewelry, especially gold.